The Town and RM had come up with resolutions to SUMA and SARM last year. Where did that initial resolution go. What did SUMA do with the mandate on the resolution? For our annual meeting each year in February we have a whole series of resolutions and they range over a whole wide variety of topics, and Energy East is certainly one of them. What we do with those is we make sure the appropriate officials—it could be federal or provincial, and the ministry that would be appropriate on the subject matter—we make sure that they get a copy of the resolution. Did you meet with the federal government or TransCanada after that first resolution? We had one member of our executive meet with TransCanada and had quite a discussion about this. What was the feedback you got from TransCanada at that point? I think positive, but it’s a business decision. They’ve been saying that the federal government has been putting too many barriers in their way. I think it’s now coming to the floor for a couple of reasons and I think it’s likely going to be an issue in the next federal election. At the AGM of the Federation of Canadian Municipalities, which is a SUMA but for all of Canada, we hear from the political leaders each year. It was in June and it was in Halifax and we heard from the prime minister, the leader of the opposition and the NDP and Green Party, and it was in Mr. Scheer’s remarks that he said if they were elected that Energy East will come back onto the front burner. And I think that has perhaps sparked some more discussion, and now with Kinder Morgan being on hold, I think that’s increased the pressure even more. What do you think of this local effort being spearheaded by the town and RM of Moosomin at the very grassroots level? Do you think that can have some impact in the national debate? I’m sure it will. And it will depend on what the uptake is on the provincial level first. But elections tend to hone the attention of people who are running for office so I’m sure it will become more of an issue as time goes on. But secondly just today, for example, Ray (Orb) and I this morning spoke on the topic of Energy East at a particular meeting. It wasn’t for the whole assembly but it was the presidents of SUMA and SARM and our counterparts from right across Canada. How did that go over, how was the reaction? I think FCM sometimes has a little bit of hesitation if they worry that the topic is going to be divisive, and perhaps worried how Quebec is going to take it. But you know, a representative from Quebec was sitting right next to me and we had a good discussion before and after the meeting, and actually the points that Ray and I made during the discussion and then with the gentleman from Quebec, I don’t think we’re all that far apart. I mentioned the safety on pipeline versus rail, because we see more and more rail being used now to transport oil. And I believe there are a few plans in the works for some major terminals to transfer more oil onto rail cars. I know. And yet I said to them and the gentleman from Quebec, our hearts went out to the people of Lac Megantic, because that was a disaster. Forty-seven people lost their lives because of an oil train, and yet how many people have died because of a pipeline leak? None. And they are very well aware of that. Their concern, I think it’s more a concern of making sure that the proper steps are taken so that there won’t be a leak, and if there is one, that the proper cleanup will be in place, and secondly should there not be some sort of compensation for all of that, because of a pipeline crossing a province. But be that as it may, the issue is that we had the discussions this morning, and in fact I was sitting next to them at lunch today as well, and the conversation continued on, so this is the beauty of FCM is that we can have these discussions, and like any discussion, any debate, when people sit down and talk they all of a sudden realize ‘you know we’re not that far apart.’ But when it gets into the public realm and then it gets hyped up, people take sides and don’t want to compromise. It’s certainly a topic of discussion here. Whether that will affect the federal government, whether that will affect TransCanada, time will tell I guess. 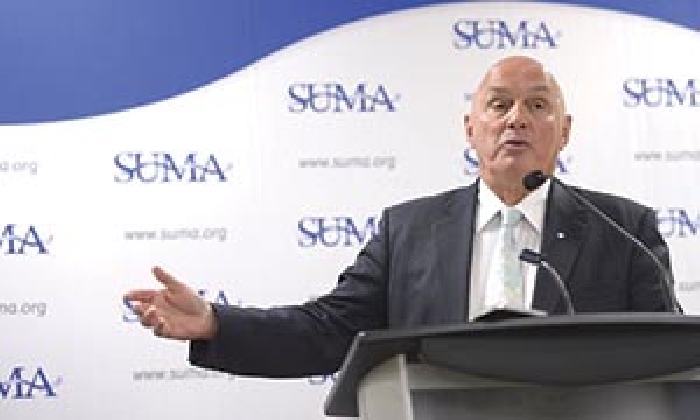 Does SUMA have a role in continuing to raise this issue going forward? I think so because we react to resolutions that have been passed at our AGM, so whatever those issues are we continue to push them to the best of our ability in a firm but polite way. I am a great believer that you don’t win anything by being rude. Do you have any thoughts on the local effort or any advice for the local committee trying to take this forward? Be firm but be polite, and keep going. Just look at how it’s increased in profile over the last couple of weeks. Clearly they are getting traction. How important do you think pipelines are in general to Saskatchewan? I’m a born and raised in Saskatchewan person and I speak very passionately about the importance of pipelines. I live in a small town in Saskatchewan and we have a rail line running through it and I am now seeing more and more and more oil trains going through. And each time I see one I have that feeling of unease, thinking uh oh, I sure hope they go through here safely. But think of the number of communities in Saskatchewan with rail through it. Virtually every community in Saskatchewan has a rail line going through it and if the rail was pulled out that town usually disappears. So it’s very important. And SUMA has entertained motions with regard to the importance of solar and wind and hydro, but oil is still a very big component of our economy and our way of life. Did you have a chance to speak with the mayor of Montreal on this issue? No the mayor of Montreal isn’t here but I have talked to others that would know her, and we will see if that message gets through or not. I don’t know what her stance is. I know what the previous mayor’s stance was, but I don’t know if that’s changed with the new mayor.